Following tough round 1 and round 2 match-ups, Drew was paired against weaker opponents in rounds 3 and 4. He was able to easily win both games. Although a win is always the best outcome, neither game gave particularly interesting or instructive positions. For round 3, Drew was paired against Al Amiri Saad from Kuwait. Although there were no games in the database for Saad, we were able to get the notation from his round 1 loss to American Ethan Pau. 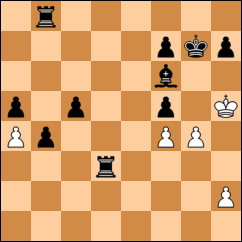 From looking at the game, GM Panchanathan decided to prepare Drew to face the King’s Indian Attack. This was an opening that Drew had not ever heard of before this coaching session. Panchanathan also told Drew that he felt Drew would win. Coming out of the round, Drew said, “Magesh must be magical. He knew that my opponent would play King’s Indian, and he knew that I would win!” While I do not think that there was anything “magical,” I do think that Panchanthan’s experience was helpful. Drew with his round 3 opponent, Al Amiri Saad from Kuwait. 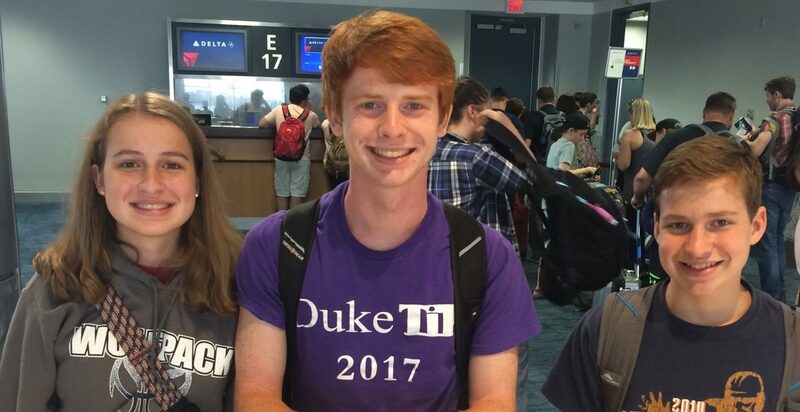 One of the things Drew is enjoying most here is the chance to get to know the other players his age from around the US. 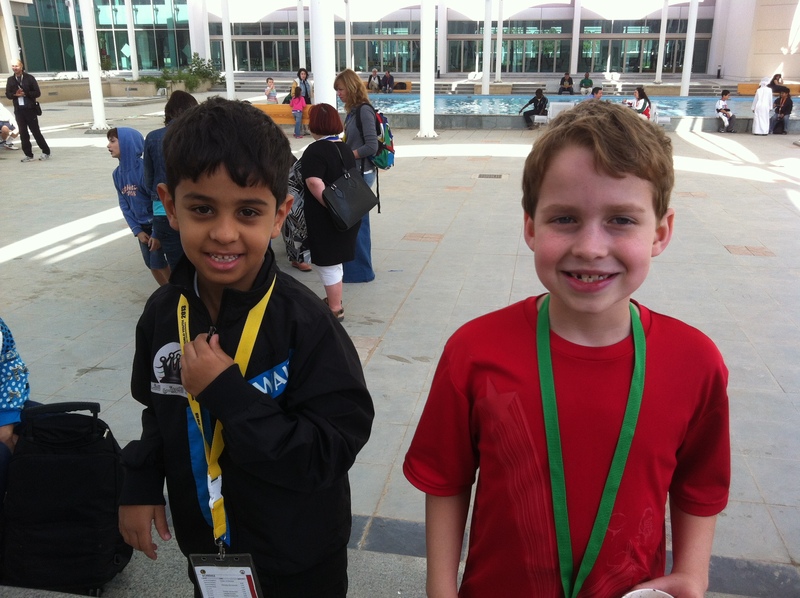 Just before going in for round 4, he received encouragement from Atreya Vaidya who played in last year’s World Youth. 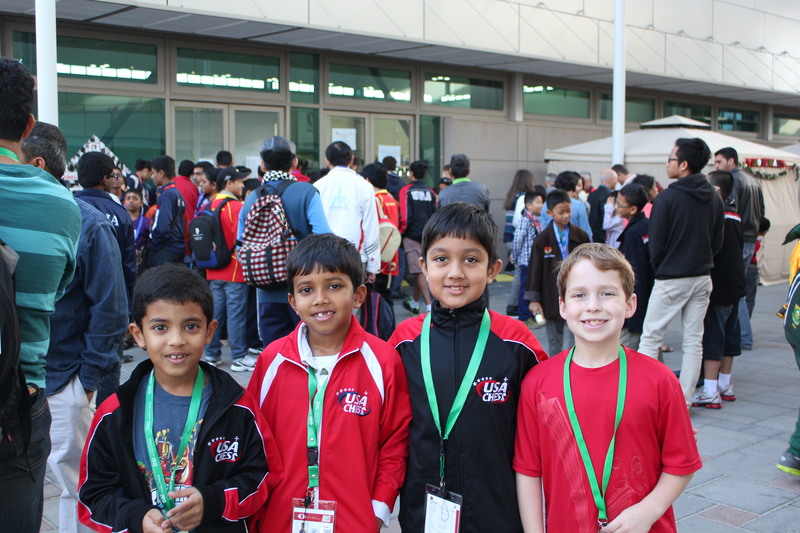 Drew with U8 team mates Maurya Palusa, Milind Maiti, and Atreya Vaidya before round 4. Day four of the tournament is the one day that the players have to face two opponents, having a 9 am round as well as a 4 pm round. Waking up early to shower, I checked Drew’s pairing online and found that he was set to face Mohamed Mustafa from UAE (his mother told me they are Syrian, via Saudi Arabia, now living in UAE). According to chess-results, Mustafa had a round 3 win against a player from the Russian federation. With no games to draw from and no time for coaching before the 9 am round, Drew would be on his own for this one. 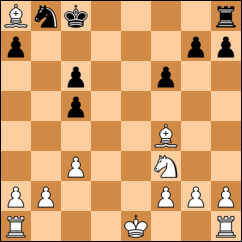 After 1. e4 Nf6 2. e5 Ng4 3. Qxg4, Drew felt confident and came away with a quick win and time to rest and prepare for round 5. 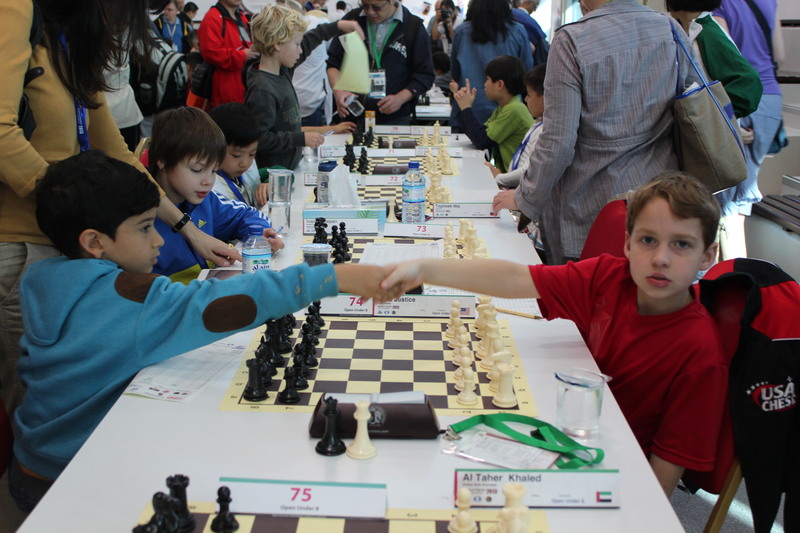 Drew shakes hands with round 4 opponent Mohamed Mustafa before they begin play.